Senate Bill 1, which would fund public education in Illinois through an evidence-based model, remains stalled while the governor and lawmakers debate provisions for Chicago Public Schools. Without an agreement, superintendents are tasked with figuring out how long their schools can stay open this school year. Bruce Law, superintendent of Hinsdale Township High School District 86, says his school could remain open for 244 days—the whole school year. Jeff Craig, superintendent of West Aurora School District 129, says he’d have to close schools by Halloween without state funding. A school’s ability to remain open depends on the district’s financial health, among other factors. They also stand to lose differing sums of money, since more affluent districts receive less revenue from the state to begin with. Craig says his district has avoided dipping into reserves thus far by issuing working cash bonds, but that a funding impasse would require them to eventually spend part of their reserves. He says the district has reduced costs over the past two and a half years as well. Law says his district would be hurt more by a property tax freeze. Rauner proposed a four-year freeze, which wasn’t included in the budget passed earlier this month. Law says any future push for a similar policy poses a bigger threat to his district’s budget than held up state funds this year. “School districts will be doing less if there’s a property tax freeze,” he says. Law and Craig join Phil Ponce on Chicago Tonight. July 14: In a letter sent Friday to principals, CPS officials admit the budget distribution process is taking place “later than anyone can remember.” They put blame for the setback on Gov. Bruce Rauner. July 10: After 736 days, Illinois finally has a budget. But it’s not all good news: At the moment, funding is locked up for all of the state’s public schools. Will schools open on time? 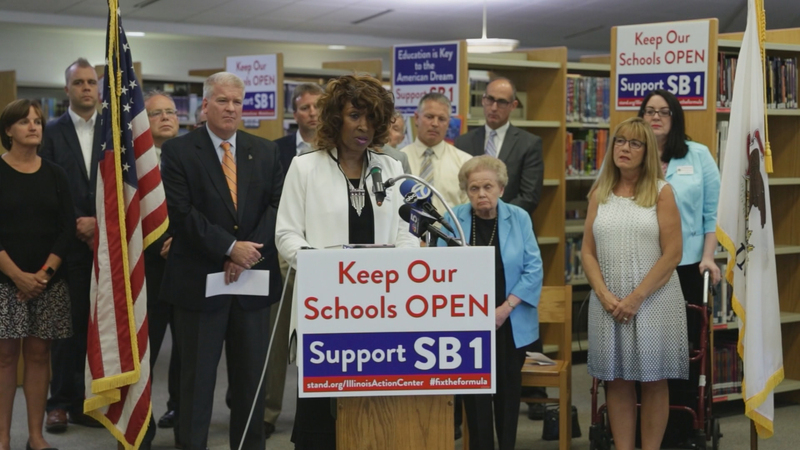 SB1124 vs. SB1: Which is Best for Funding Illinois Education? June 30: Following successful Illinois House and Senate votes on a Democrat-backed education funding reform bill, Republicans are taking a shot at fixing the nation’s least equitable education funding formula.